Cold weather and slippery streets got you down? Pick up your spirits this weekend with any of these top entertainment picks, as chosen by CBC Manitoba's trio of broadcast personalities. Cold weather and slippery streets got you down? I am sending you to see an award-winning play that will make you think twice about what's underneath your clothes, and what's in your heart. Intimate Apparel is is set in New York in the early 20th century. 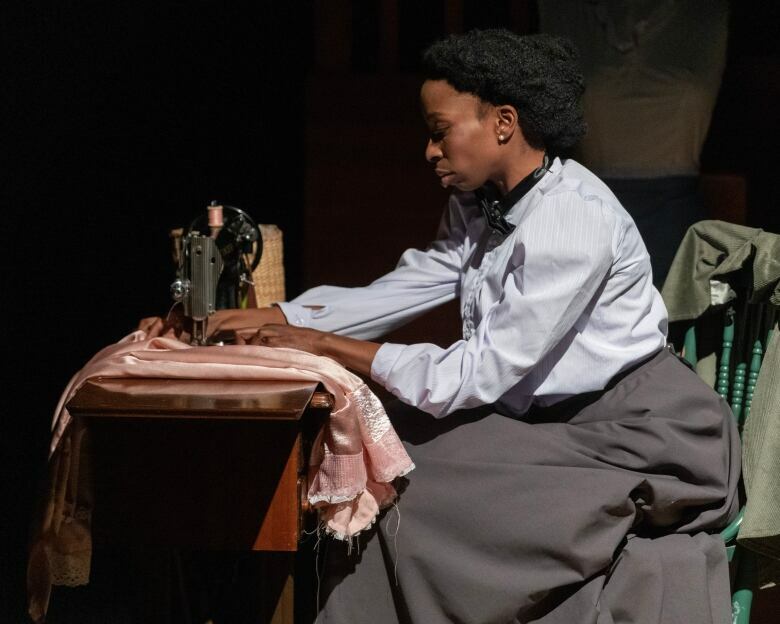 The main character is Esther, played by Beverly Ndukwu, an African-American seamstress whose skills of garment creation are utilized by many kinds of women of varying social stature. Through the course of a play, Esther decides to take a chance on love. But her heart is torn between two men. One hails from the Caribbean and writes letters to her from across the ocean. The other is the kind Jewish shopkeeper from whom she has been buying her fabric over the years. Intimate Apparel debuted in 2003, with playwright Lynn Nottage winning a Pulitzer Prize for the story, based on her grandmother's life. Intimate Apparel is staged at the Berney Theatre at 123 Doncaster St. The final shows are Saturday at 8 p.m. and Sunday at 2 p.m. Tickets range from $15 to $42, and are available online. This weekend, celebrate the Year of the Pig with the Manitoba Great Wall Performing Arts Inc. On Saturday, the Club Regent Events Centre will be transformed into a theatre with multiple performance artists from Winnipeg and China showcasing their talents. Equally as exciting, a traditional feast will be available to fill your belly before the show starts. Performers include the Wuxi City Opera and Dance Theatre, Hebei Acrobatic Troupe Performing Arts Company and the Sichuan Cultural Exchange Troupe, all from China. Singing, dancing and aerobatics will be at the forefront of activity, bolstered by magic and a new year's lucky draw. The Manitoba Great Wall performing group will also feature local artists, providing an eclectic show of Chinese-Manitoban talent. From dumplings to foster wealth, sweet rice to celebrate family, and noodles to bolster longevity, you can find your fortune through an array of traditional dishes to help celebrate. Significant to Chinese culture is the assumption of lucky and unlucky events, objects or even numbers. "What animal a Chinese person belongs to is very important," says Fisher Wang, general manager of Ido Media. "[The Year of the] Pig is a good thing, good year and parents are planning to have [a pig] baby this year." Wang says that while he's not an overly religious person he does think there's something to the personality attributes that are associated with different Chinese zodiac signs. "I think the descriptions are accurate to a certain degree, " says Wang. Whether you're serious about the zodiac, or just appreciate a great meal and a great show, the celebration at Club Regent is sure to bring happiness to the beginning of your year. The celebration takes place Saturday, Feb. 9. Dinner starts at 5 p.m. and the show starts at 7 p.m.
Tickets range from $30-40 for the show, $150 including dinner. I want to send you on a trip to the country! Back in November, Winnipeg country artist Sean Burns brought a bunch of friends down to the Times Change(d) with his band and played a show. Sean has the down-to-earth style of an authentic storyteller. He says he's been dreaming of making country music great again and he has a passion for traditional sounds and a contemporary delivery. Sean has toured relentlessly from one end of Canada to the other and across the United States. He's a hard-working country man and his live recording from November featured some other great country artists from the Winnipeg scene, including Del Barber, Skinny Dyck, Sol James, Frannie Klein, Gerry McIvor and Andrew Neville. Friday night is the official release of the album. It's called A Night of Country Music and a portion of the proceeds of the night will go to supporting CKUW's Fun Drive! The night will also feature other wonderful performances by some of the best country musicians in Winnipeg, with an opening set from Knob & Tube (Chris Dunn and Joanna Miller) and special appearances by Vince Andrushko, Frannie Klein and Andrew Neville. And of course Sean Burns & Lost Country will headline the show. It all goes down at Times Changed Friday night. Tickets are $15 in advance and $20 at the door. Doors open at 9 p.m.